The davit arrangements type ZZ-ZOL are included in the rescue equipment of vessel and are intended for the launching and recovery of rigid or inflatable rescue boats fitted with complete equipment and occupied by the permissible number of persons. The davit arrangements operate at vessel's heel up to 20° or either side and trim up to 10°. 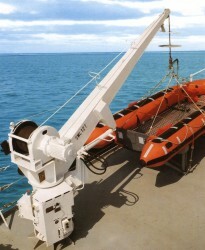 The davit arrangement consists of the radial davit type ZOL, boat winch, lifting hook (only for inflatable rescue boats), rigging and stand for the rescue heat. The davits are provided with remote control of winch brake from inside the launched rescue boat. issued by the marine Classification Societies. The type of rescue boat should be specified in the order for davit. The davit arrangements type ZZ-ZOL are included in the rescue equipment of vessel and are intended for the launching and recovery of rigid or inflatable rescue boat fitted with complete equipment and occupied by the permissible number of persons. The davit of this type can he applied on vessels, on which height between embarkation place and ship waterline on conditions on minimal load is less than 4.5 m. The arrangement operates at vessel's heel up to 20° at either side and trim up to 10°. The davit arrangement consists of the radial davit type ZOL, heat winch, lifting hook rigging and stand for the rescue boar. The davit arrangements type ZZ-ZOL are included in the rescue equipment of vessel and are intended for the launching and recovery of rigid or inflatable rescue boats fitted with complete equipment and occupied by the permissible number of persons. The davit arrangement consists of the radial davit type ZOL, boat winch, rigging and stand for the rescue boat.